It was holiday time again. Easter Holidays to be exact and time for the “Boys” to have another ramble. Larry had come up with a walk. “It’s only about 10 miles!” I was informed so it should be easy for my aging legs, particularly as I was almost in peak fitness having recently spent a holiday in Malta where, with Anne, I had walked the length of the island in easy stages. In addition to this, two days before, accompanied by Anne, I had had a pleasant excursion of about 7 miles on, and around, Leckampton Hill above Cheltenham. So I was ready for a pleasant days walking and the opportunity to have lunch at a country hostelry. Arriving at Dursley at about 9.30 a.m. we were able to secure a parking place, which was free, which naturally made Mick very happy, and soon with Larry and Peter the four of us were toiling uphill along the Cotswold Way. 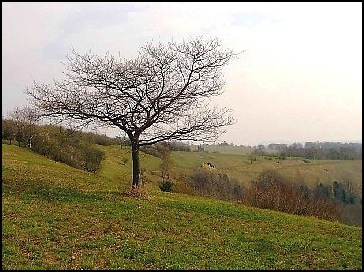 Stinchcombe Hill was the first high spot of the day, with a height of 219 metres, or about 720 feet. Although we did wander off the most direct route up the hill this was only a minor aberration and we soon reached the golf course which utilizes the hill’s plateau top. 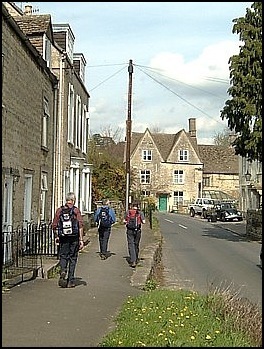 We then walked around the top of the hill in an anti clockwise direction generally following a Cotswold Way detour. On the north rim of the hill we had views towards the River Severn, but regrettably, because of mist, we were unable to get really good views of the landscape to our north and west. Continuing around the hill to Drakestone Point, we had views south towards North Nibley and the Tyndale Monument, which looked like Cleopatra’s Needle, perched on top of Nibley Knoll. We then left Drakestone Point and walked the Cotswold Way, along the rim of the hill, first north-eastwards and then south, before descending through the oak and beech wood as we aimed for North Nibley. seen between Stinchcombe Hill and Nibley Knoll. This was very pleasant. Although there were a few ups and downs, particularly an ascent along an old sunken lane on the outskirts of North Nibley, the going was fairly easy, or it would have been if Peter had not been jet propelled and making it difficult for the older members of the group – me -, to keep up. Oh to be young and fit. It was at this point, probably because I was trying to keep up with Peter that I nearly made a navigational error, and guess what, I was reminded about it for the rest of the day with comments about ”upside down compasses and maps”. Seems like my “friends” were getting their own back for previous comments I may have made about them. 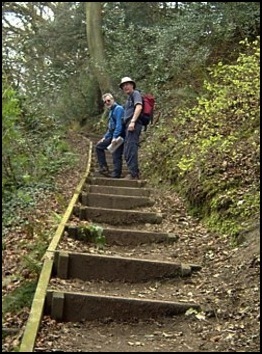 Mick and Larry on the steps leading to the top of Nibley Knoll. 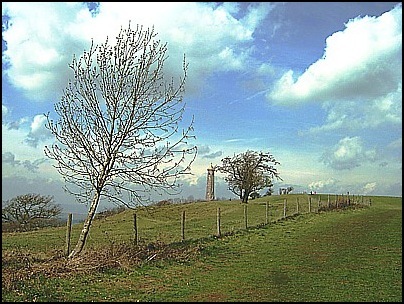 Nibley Knoll, at 660 feet, was reached. The “Boys” however had been a bit crafty. It wasn’t until we were nearing the Knoll that I was informed we were going up to the monument on the top of this hill. Fortunately part of the path to the top consisted of a large number of steps, which helped the ascent. I didn’t bother to count them, but there were plenty, so it was a real relief to get to the top of the knoll, sit on the stone “seats” around the Tyndale Monument and have a well earned break. 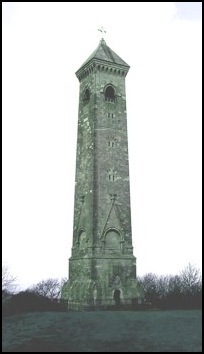 However, although I was very warm having toiled to the top, the wind whistling around the monument soon cooled me down and I was pleased I had brought a fleece top that I could wear. who translated the Bible into English in about 1530. Looking back towards Nibley Knoll and the Tyndale Monument. Two of our number entering the woodland between Nibley Knoll and Wootton Hill. A very pleasant part of the walk. 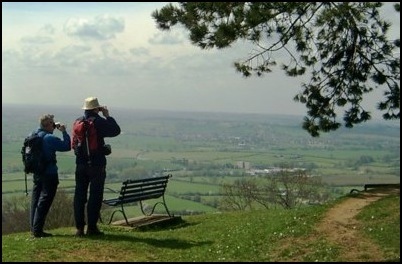 Break over, it was pleasant to walk the mile or so southwards along the ridge from Nibley Knoll to Wootton Hill where, now that the mist had cleared, we had wonderful views downhill to Wootton under Edge and the bridges over the River Severn to the west. 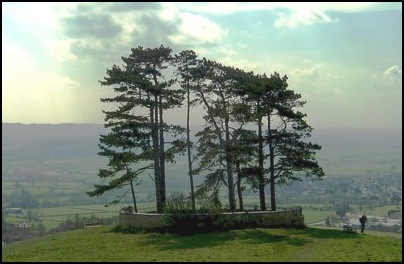 The clump of trees on Wootton Hill overlooking the town of Wootton under Edge. the view of the River Severn and the Severn Bridge. A part of Larry's photograph of the River Severn and Bridge seen from Wootton Hill. You can just see the "towers" of the bridge. By now we were getting hungry. It was fast approaching 12.30 p.m. and Larry had booked a table for us at the New Inn at Waterley Bottom for lunch. So it was best foot forward, leaving the Cotswold Way to get on to the London Road, which despite the impressive name is no more than a narrow lane. In less than ½ mile we turned left off the London Road and then it was northwards to the Pub at Waterley Bottom, a mile or so further on at grid reference ST758693. I really enjoyed the walk to the pub. 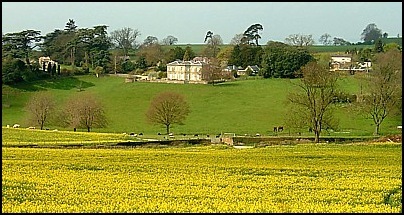 It was down a narrow country lane between high banks full of trees and plants. It was so pleasant I won’t even mention, in detail, the short cut Peter took us on, which meant we had to retrace our steps. Yes we can all make navigational errors! The distance, we had covered by the time we reached the Pub, according to Mick’s GPS was just over 10 miles. We really needed our lunch stop. or was he just posing, in the narrow lane leading to the New Inn. The Pub was really good. There was an excellent choice of real ales to enjoy, so we all tried half pints of some of the different varieties, to wash down our lunch. All were much appreciated after the morning’s endeavors. The New Inn at Waterley Bottom. After the inevitable photo shoot outside the pub, when Larry had to almost lie on the ground to get us in focus and set off his camera’s self timer so we could all be in the picture, we were off up another hill. 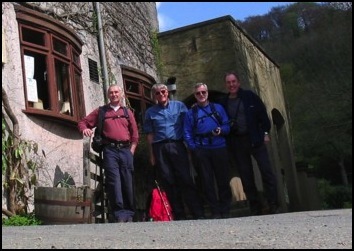 Larry's photograph of the "Boys" outside the New Inn. 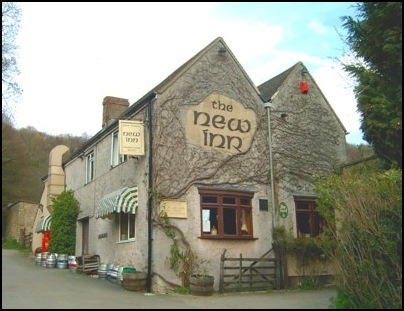 The New Inn is located at the farthest point that is accessible by vehicles up a very narrow lane. 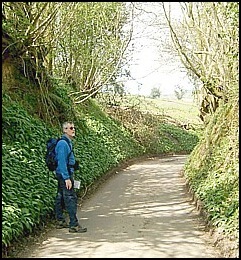 Although the lane continues beyond the pub it becomes a steep sunken track, probably an old salt way. Not the sort of track you really want to ascend after 10 miles, lunch and beer, but ascend we did. Breakheart Hill is the name of this “little” ascent. Seemed quite apt, although it was probably easier than the previous two “pulls” we had had earlier in the day. Don’t know the highest point but from looking at the OS map for the area I estimate it to be in excess of 600 feet. The ascent of Breakheart Hill. At the road at the top of the hill we went right (east) for about a mile before going into Folly Wood and then Coppers Wood before going downhill over fields to Uley. 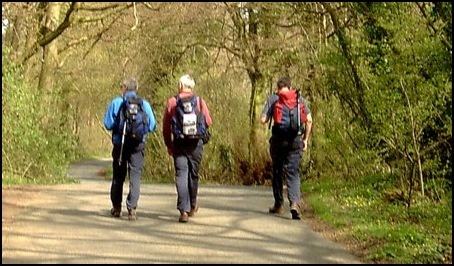 Mick, Peter and Larry on the road to Folly Wood. 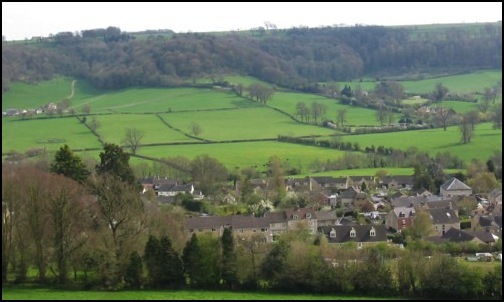 Originally the intention was to go from Waterley Bottom – “Don’t you just love that name” – more or less straight back to Dursley and then home. But Mick was aware of a small brewery in Uley and he was keen to have a look at it and visit its “visitors centre”. Well he was right about being a small brewery. It looked like a house with a big garage and it was only by luck that we spotted it. Uley however seemed a very pleasant community. Looked like a good place to live. But we had no time to spend admiring it. We had to get back to Dursley. We were fortunate that Peter had picked a very scenic route for our return. Yes you’ve guessed it. Having found the correct path behind Uley Church we went straight up another hill. The view of Uley Bury which we saw as we left the woods and approached Uley. 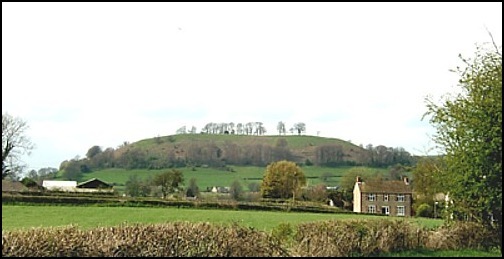 Uley Bury, height c 750 feet, was the next ascent. It is an old hill fort. If you want to find out more about it click here. So we walked uphill across a field and then along a steep path through a wooded area. Needless to say I brought up the rear, but I did stop to take some photos and admire the view. Going up the hill to Uley Bury. Uley from half way up Uley Bury. Peter and Mick then went the wrong way and I’m very grateful to them for doing so. 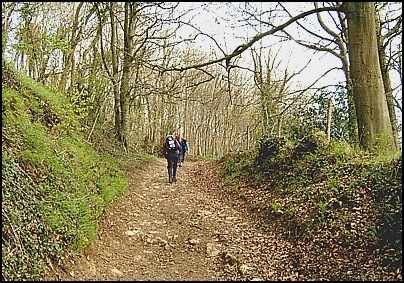 It had been intended to take the Cotswold Way back into Dursley, via Cam Long Down. However, before we reached the top of the Down” we would have to loose height and then have an ascent of about 300 feet to the top of the Down. Not the most energy efficient way to get back to Dursley. But thanks to a wrong turn on the top of Uley Bury, Peter and Mick lead us south west along the north west side of the “Bury” before descending to Hydegate and then it was west along the road until just after Uleyfields where we turned off left (south east) to take a right of way across fields back to Dursley. 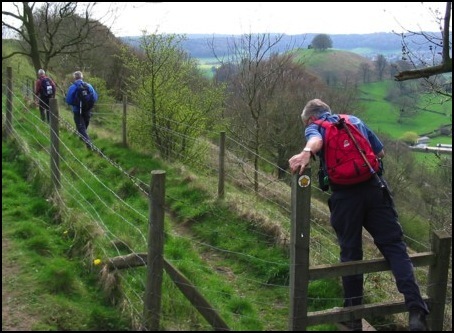 Peter, Mick and me, navigating a stile, as we descend from Uley Bury. It had been an excellent, and very enjoyable day’s walking, but oh those ascents. Unfortunately during the later stages of the walk Mick’s GPS had a malfunction – the batteries went flat. However, after the walk Mick checked the total distance on some very clever computer software that came with his GPS. The program showed that the total distance of the walk was 15.5 miles. It actually seemed longer than that, which was probably because of the ascents, which the software calculated as being 2,800 feet. If you would like to do this walk the OS Explorer Map for the area is No. 167 (Thornbury, Dursley and Yate).